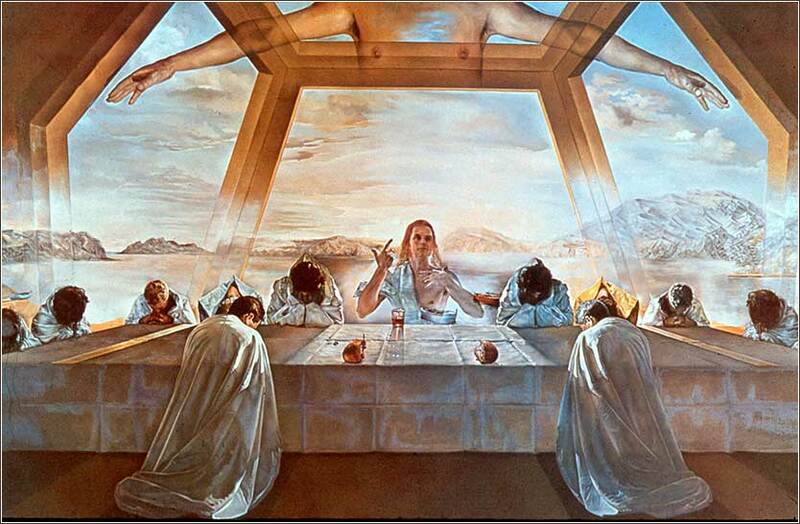 Sacrament of the Last Supper by Salvador Dali, ca. 1956. Dali’s interest in painting Christ, and the reverence with which he treated the subject, are not widely known. A serene and beautiful setting of the traditional Abide with Me. God of love, my prayer is simple: Your son, Jesus, suffered and died for me. I know only that I cannot have real strength unless I rely on you. I cannot feel protected from my many weaknesses until I turn to you for forgiveness and your unalterable love. Help me to share this strength, protection and love with others. And finally, may the grace of Christ our Savior, and the Father’s boundless love, with the Holy Spirit’s favor, rest upon me, and all of us, from above. Thus may we abide in union, with each other and the Lord, and possess, in sweet communion, joys which earth cannot afford. What Bible verse assures us that, if we confess our sins, God will forgive them? The Last Supper (detail), a mosaic by Raffaeli (ca. 1790) from Da Vinci’s masterpiece. Judas, clutching his moneybag, spills the salt, giving rise to a superstition that is still with us. Now on the first day of Unleavened Bread the disciples came to Jesus, saying, “Where will you have us prepare for you to eat the Passover?” He said, “Go into the city to a certain man and say to him, ‘The Teacher says, My time is at hand. I will keep the Passover at your house with my disciples.’” And the disciples did as Jesus had directed them, and they prepared the Passover. 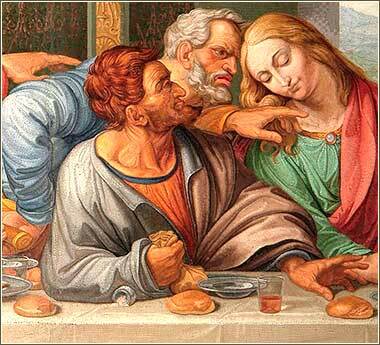 he three Synoptic Gospels are very close in their telling the Last Supper story, with minor differences in details. Most Christian denominations agree that the apostles prepared the Passover meal on Thursday. The Last Supper is Thursday night and Jesus will be crucified and die during the day on Friday. The Jewish days began and ended at sunset, rather than midnight, so although Christ was crucified on Friday by our reckoning, it was on the same day as the Last Supper by Biblical reckoning. The Passover lamb was actually killed during daylight on Thursday (thus, to a Jew, on the day before the Last Supper), but the more important events in the Passover occur between sunset on Thursday and sunset on Friday: The recollection of the Jews in Egypt painting lambs' blood on their doorposts, so that the angel of death would “pass over” their house, and the eating of the sacrifice. Jesus identifies Judas during the Passover meal. He uses the ancient idiom, “you have said so,” which is an oblique way of saying “yes” without actually saying it, by acting as if a question is a statement. We will want to remember this, for Jesus will repeat the idiom several times: when Caiaphas asks him if he is the Son of God, and when Pilate asks him if he is the King of the Jews. We get a mixed message about Judas' free will. Jesus' death is preordained, for his destiny is to fulfill the prophets: “The Son of Man goes as it is written of him.” But he seems to contrast the inevitability of his own death with Judas' betrayal, for the warning he gives to Judas might imply that Judas could change his mind. In John 6:70, Jesus says that one of the apostles he has chosen is “a devil”. Also notice that Judas calls Jesus “Rabbi”, meaning “Teacher”, rather than “Lord” as do the others. So there seems to be very little chance that Judas would actually change his mind. But Christ, even knowing that it is futile, must nevertheless attempt to warn Judas away from his betrayal, for it is his character and his purpose to forgive sinners. He does not mind that Judas will cause his death; but he does not want to see Judas condemned to hell. God sent Christ into the world that “whosoever” believes in him would be saved (John 3:16). He is so completely dedicated to our salvation that he will do all in his power to save even the most terrible of sinners, and even if he realizes it is hopeless. If he is this eager to save Judas, how eager he must be to come into our own lives and give us the gift of eternity!